I found some wonderful classic children’s books from the 1940s that kids and parents can still enjoy today. Let’s take a look at a few, shall we? 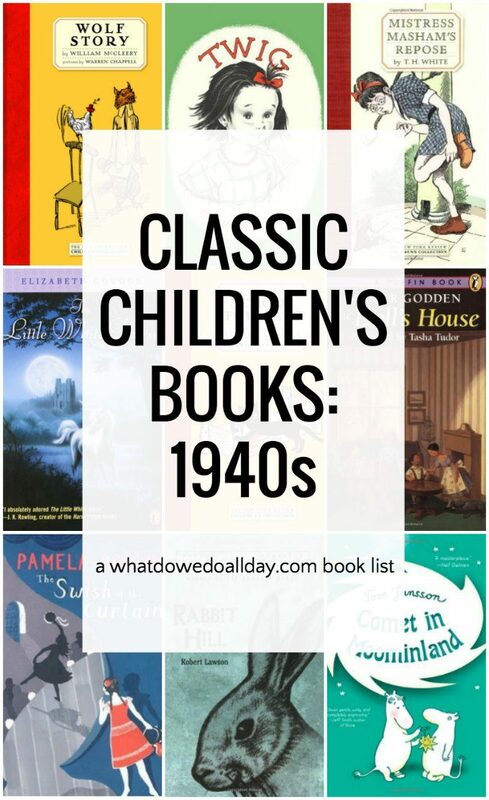 If you have been following my 20th century classic children’s books by the decades lists (I love you.) then you know I have been bumping off the big name titles in order to introduce you to books which you might otherwise have passed by. Wolf Story. (1947) Five year old Michael wants his dad to tell him a story about a wolf, and a hen named Rainbow, but as five year old will do, he keeps interrupting to instruct his dad on the story details. A humorous short novel great reading aloud to younger kids. This is the first book on my list because it only just came back into print and I don’t want you to miss it! Twig. (1942) This was another favorite of mine when I was a girl. With a few found objects Twig transforms her corner of Chicago into an imaginary, fairytale world. A little Elf, who comes out of a book shrinks her down to size so she can join the fairies… for a while. So sweet and charming it’s hard not to love this book. A great read aloud for fairy-loving kids. The Swish of the Curtain. (1941) I’m including this 1940s children’s book as a bit of an in-house favorite since the plot revolves around the theater. Written when the author was only 14 (! ), the book follows the adventures of seven children as they produce and perform in their own stage company. If your children have read and enjoyed Noel Streatfield’s Shoes books, this book should be next on the list. Comet in Moominland. (1947) This is the first of Finnish author Tove Jansson’s Moomin books. All the Moominbooks are gentle, quirky fantasy stories about a group of charming creatures. In this book Sniff and Moomintroll learn a comet is heading towards Moominvalley. Only the greatest of curmudgeons will not love Jansson’s creations. The Little White Horse. (1946) Goudge was a favorite author of the young J.K. Rowling for those of you who enjoy facts like that (as I do!). Orphan Maria Merryweather goes to live with her cousin in his beautiful home, Moonacre Manor. A secret and magical past surrounds the house and Maria find herself smack dab in the midst of an intriguing mystery in which she is the heroine. The Twenty-One Balloons. (1947) This Newbery Medal book follows the journey of Professor William Waterman Sherman who crossed the Pacific in his hot air balloon only to land on the isolated island of Krakatoa. He finds a strange society centered on the wealth of the local diamond mine and escapes with them when the volcano erupts. There is much in this book to interest kids who love adventure and fantastical inventions. The School for Cats. (1947) There are many sweet and funny books from Ester Averill about black cat Jenny Linksy and her urban feline friends. In this one Jenny goes off to cat boarding school where she encounters Pickles, the fire cat. Perfect for kids just delving into chapter books. Rabbit Hill. (1944) Anthropomorphized animals in rural Connecticut hope the “New Folks coming” to their farm will will bring positive changes to the land. Things don’t go quite as expected, however. A lovely read for those who love animal stories. Mistress Masham’s Repose. (1946) Parent-less but spirited, Maria, discovers Gulliver’s kingdom of Lilliput. Humorous adventures, decaying English manors, odious guardians and a resourceful heroine are always hallmarks of a classic children’s book. Great for older kids or as a read aloud. 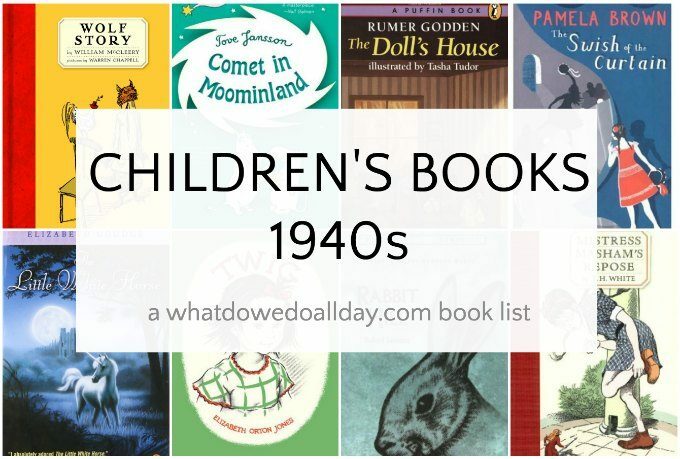 Have you read any of these 1940s children’s books? Leave a comment and let us know. I love Jenny and the Cat Club. I also loved Rumer Godden's doll books as a child but Miss Happiness and Miss Flower was not as good as I remembered upon rereading recently. Now. A Swish in the Curtain- a book written by a 14 year old! I think that one will top my TBR list! I know! I can't write a book and I'm nearly (cough cough) 40! I enjoy reading about all those books I've never heard about before. Only Jenny Linsky is familiar to us from your prior recommendations, and it was a big hit in the house. I love how you are going through the decades with books like this! I'm definitely looking forward to trying some of these out! I know you'll enjoy them. I LOVED The Swish of the Curtain (and the Blue door Venture) as a child but had no idea that it was written by a 14 year old! They are really hard books to get in Australia too. The Little White Horse and the Moonin books were favourites too as well as the Doll's House. But I don't know the others – yay for some new books to discover! I'ld also put in a bid for The Otterbury Incident By Cecil Day Lewis (Poet laureate and father of actor Daniel D-L). I don't think it's nearly as well known as it should be – I loved it as a child and the pictures (the ones in the original edition) are fabulous. BTW I'm really enjoying 'The Trumpeter of Krakow' – it's a corker! Jen, I feel like it's become a challenge to make a list with no books on it that you've ever read! I'm always so impressed that you know so many books on these lists. Thanks, Melissa! Those Moomins are pretty cool. Thanks for letting me know about Wolf Story. I can’t wait to get it for my granddaughter! I never read any of these as a child, but I have read The Twenty-One Balloons and Rabbit Hill to my own children. Love them! My 30 year quest is over. I have been on a holy grail type mission, seeking a favourite childhood book, and found it on your site. It was difficult journey, because I could not recall title, author, or character names, only had a vague recollection of little girl who lived in a building with porches and stairs, with a little stream in the yard caused by run-off from the drainpipe, where she played and was shrunken down to miniature size. Of course this was TWIG, as I now know from reading your blog. Being able to click on the link and taken to Amazon, there was a big a-ha moment on seeing 2 illustrations vividly remembered (of the apartment house and the turned over tin can). Although I was unable to find this book when my children were young, I will buy it and tuck it away for sharing with possible future grandchildren. You have created a wonderful resource for parents and diehard fans of children’s literature. Thank you a million times! Kim: I am so delighted to hear this! Thanks for letting me know. It so nice to get confirmation that writing these posts helps people find the books they want! My sister & I had two books, both were “Tall Tails”. Each book had quite a few stories in them. One other series we had was “Uncle Wiggley” . I’m not sure, however I believe I remember a character named Nurse Jane fuzzywuzzy. Do you know where I can find them? My best advice is to look at used book stores or places like ebay and the like. It can be tricky to track down copies of out of print books. I once googled a title every day until I found it somewhere. Good luck! The Little White Horse was one of my absolute favorite books growing up. I can’t tell you how many times I checked it out of the library. When I finally found a reprint of my own, I also found Linnets and Valerians, which was equally charming. I have a hard time finding good books that my two boys will be interested in reading though. They tend to pick up the popular stuff, and the graphic novels, despite being good readers. Since we started homeschooling, I’ve been trying to find good books that aren’t especially girly. Thanks for these lists! I hope you enjoy the lists! Thanks for your comment. I just stumbled on to your site! And I am so delighted to see yourecommending The Dolls House and Mistress Masham’s respose! Since childhood (1940s) I have loved books about dolls who come to life and have adventures and books about tiny people–like Mistress Masham and The Borrowers. I kept dozens of titles all these years, and now I check out copies to the neighbor children with “library cards.” I was just idly searching for a book called Marny Moo or a book with a character called by that name. My mother read it to me in the very early 40s. I have never found it. But I will keep looking. Maybe “Rainy Day Stories” published by McLoughlin Brothers in the 1920s? Thanks for being so helpful with all your answers to these queries, Kate! I read this book in the mid 1950’s. I’m looking for a book I was given in the early fifties. It had stories for children ( I remember it being a vey serious book) and there was a poem in it that has stayed in my memory. I think the poem was called’ it’s time little people were going to bed’ and a line from it was’Caw said the rook as he flies overhead, it’s time little people were going to bed’. Would anyone know the book? I would love to own it again. Think it must have been published pre1950’s as it was given to me by an older cousin. If anyone can help I would be very grateful. Try ” Fun and Frolic” collected/edited by E. T. Roe. Seems to include the poem you reference! i am looking for a book that i had as a child around 1946-1954. it featured a standard black poodle that may have had a fuzzy texture on some of the pages. the story was set in a lady’s hat shop possibly in paris. i remember the illustrations being charming. if you could help with any information i would be very grateful. thanks. There’s “Pompon: The Story of a Poodle” by Dorothy L’Hommedieu, a chapter book published in 1955 – or maybe “Woofus the Woolly Dog” by Jane Curry and published in 1944? That one has a fuzzy texture on the black dog images… Hope you find it! Like to find book from the early 50’s. “When Washington Danced” A hard back green book. I recall my mother buying it for me at Leary’s Book Store, Phila.Pa. I read it in the public school system. I am looking for a US children’s book that I read/was read to me in the 1940s – about a little black girl named April. Any ideas? I’m sorry, that does not sound familiar. I AM LOOKING FOR THE BOOK, IT MAY BE CALLED SOMETHING LIKE “THE WILD JUNGLE PARTY”, IN WHICH A PLANE FULL OF PARTY FAVORS, HATS ETC., CRASHES IN THE JUNGLE AND THE ANIMALS ALL HAVE A GOOD TIME DRESSING UP, BLOWING THE PARTY NOISE MAKERS AND THE LIKE. I THINK IT ENDS WITH A PAGE OR TWO OF “THEN THE GORILLA FOUND A MACHINE GUN…” AND THE LAST PAGES SHOW AN EMPTY SCENE WITH FAVORS SCATTERED EVERYWHERE! IT WAS MY YOUNGER SISTER’S FAVORITE, AMONG MANY! WHAT IS THE TITLE AND IS IT STILL AVAILABLE? WOULD LIKE TO SURPRISE HER FOR HER 77TH. I have a book read to me as a child Im now 76 the publisher and authors page is missing and the date it was published I remember it from when I was about 4 or 5 . Anyone saved a copy?